The Bella Airfryers are probably the best airfryers that you can get in the given price range on Amazon. Being one of the best, the Bella Airfryers is a neat air fryer which you can use to reduce your oil consumption while still enjoying your fried snacks like French fries and Chicken Wings. Yes, in most of my reviews I do mention these two snacks a lot and they are French fries and Chicken wings but since these two dishes are the most I make on any air fryer, it gets easier to compare air fryers based on them. French fries when deep fried give an amazing taste and with the Bella Air fryer, you would find similar results. The Bella Air fryer is not just limited to French fries and chicken wings but you can also cook meat, steak, and cook desserts. Yes, you have a whole cookbook on the different dishes you can cook with an Air fryer and if you are looking for an affordable yet good quality Air fryer then this one from Bella should be your way to go. Yes, you heard me right, this Air fryer can cook most of the dishes within 15 minutes which is pretty amazing. Although you might want to avoid layering food as if you do that then you might have to remove the tray after a few minutes to turn the food around so that it is cooked evenly. The cooking basket is medium sized which means you can easily cook snacks for 1-2 person at a time and in the case, you plan on layering food in the basket to cook faster then you can easily cook for 2-3 people. The Air fryer is a good sized one and you can easily fry foods for 2 people at once. The problem would arise if you have too many guests over, then you might have to cook in batches. The Bella Air fryer can be used to even cook food like meat and make grilled sandwiches. 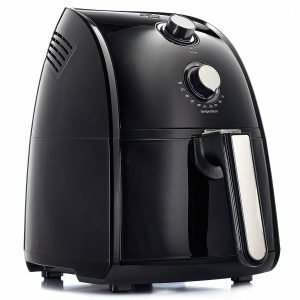 The Air fryer can even be used to make desserts and steam vegetables. The Bella Air fryer can cook almost anything, however, you might not be able to use any liquids inside the Air fryer but apart from that cooking is fun with this kitchen gadget. If you want to use oil in any of your dishes, with 1 tbsp of oil you get the feel of the fries being fried. When we cooked french fries in an air fryer for the first time, just using 1 tbsp of oil along with some spices did the trick. The French fries tasted really good and even though it was not like the completely deep fried fries but to be honest they were actually good and I could not complain about the taste. With the Chicken Wings, I never used oil at all (used a bit in the marination and not directly on top of the wings)and that is the best part of the Air fryer, the chicken wings came out perfect and the way they would have if deep-fried. 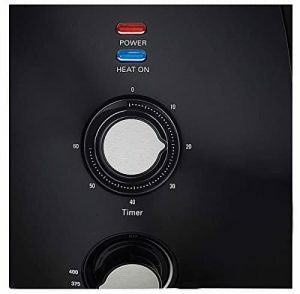 The Air fryer comes with really easy timer settings where you can timer it for anywhere between 0-60 minutes. You can cook anything in the fryer with perfection. It also comes with an auto shut off which is a good safety feature. The temperature of the air fryer can range anywhere from 175-400° F. Once you set the temperature and the timer, you are all set to cook whatever you put in the cooking basket. The cooking basket is dishwasher safe and you can easily clean it and use it again. Something I really like about air fryers, in general, is that they are really easy to maintain. All you need to do is clean the cooking basket once you are done and that is it. you do not have to dirty multiple utensils to cook a dish making this air fryer really handy and easy to use. There are a few air fryers which actually give away the odor of the food that you have been cooking. However, this is not the case with the Bella Air fryer. You can easily cook without having to worry about the place getting smelly which proves really useful especially when you have guests over your place. 1. You cannot cook food for more than 3 people at a time, so if you have guests over then you might have to cook in batches which might cool down the initial batches of snacks made. 2. If you are looking really large quantities of food, it can take quite a lot of time as you would be cooking in batches. 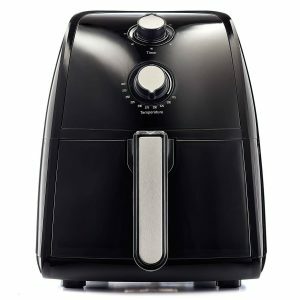 Honestly, the Bella Air fryer is one of the best Air fryers that you can invest your money in, however, if you are looking for something with a larger space then you might want to check something from the Farberware series as they do have a larger capacity air fryer. This Air fryer from Bella is perfect for someone who is looking to serve just 1-2 person at a time and if you are one among the health freaks who wants to eat Fries and other deep fried snacks but as a healthier alternative then the Bella Air fryer is your choice. Do check out the Air fryer on Amazon and let us know what you think about it in the comments section below!